Having reliable restraint equipment in an emergency is important for handling threats and protecting citizens in the area. We carry cuffs, universal handcuff keys, and handcuff cases suitable for law enforcement teams large and small. Our handcuff keys are small and discreet, so they can be worn in a shirt pocket, pants pocket or easily attached to keyrings, belt loops or other duty gear. Each key has been heat-treated to prevent warping or bending of the metal and includes a lifetime guarantee to work with the majority of handcuffs. Our police handcuffs for sale are offered in color-coded varieties so you can allocate them to various tactical teams or use them for different threat levels on suspects. Each pair has been precisely machined to withstand force and pressure, giving you restraints that will hold up under stress. Our police handcuffs for sale also universally fit into most handcuff cases that conveniently loop onto your belt for quick access. 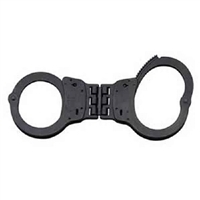 We carry your favorite brands of handcuffs for sale, either hinged or chain and handcuff keys, including Smith & Wesson, ASP, Peerless, and Zak Tools. Keep your law enforcement teams properly equipped to handle threats with our selection of police restraint equipment at great sale prices. Shop with us today or give us a call if you have any questions or concerns regarding our police restraint equipment!